Stop Smoking In 1 Hour! 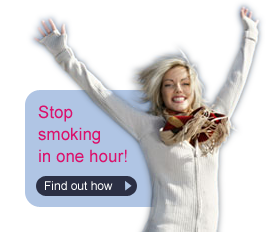 If you genuinely want to quit smoking then Lynn Willert Hypnotherapy guarantees that you will kick the habit! Wanting to quit is the first and most important step. Doing something about it is the hardest. With so many options to choose from, how do you know which one is right for you? And whilst patches and supplements do work for a significant proportion of smokers, they don’t alter the root cause of addiction – cravings. Most treatments attempt to mask cravings and gradually reduce to tolerable levels. This can be costly, time consuming and frustrating. We believe that fundamentally changing your attitude towards smoking is the only sustainable, guaranteed method of quitting. Most importantly, it delivers immediate results. One consultation is all that you need. And if the cravings return, we will provide treatment free of charge until you are completely smoke free. No other course of treatment can offer such a confident prognosis. Contact us now to find out more or arrange an appointment.